Copper is on trend this year. Furniture and antique shopping are my favorite ways to spend the day. I get to have fun, decorate and get my ‘steps’ in all in the same time—what could be better than that! If you add a couple of friends and lunch to the day I am in heaven. 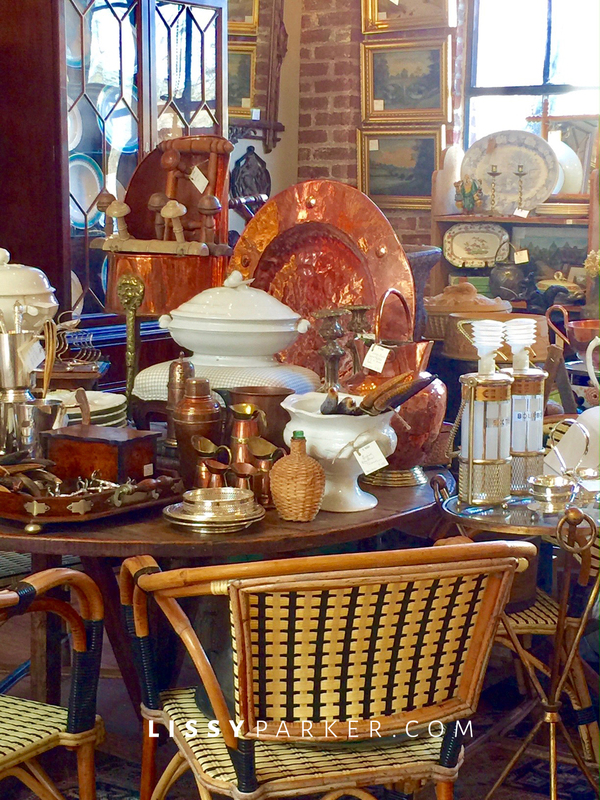 On my latest trip to Atlanta, I made Peachtree Battle Antiques a shopping must. The store is always a visual delight. The arrangements are always creative and inspiring. I found mirrors, chairs, planters, china, table cloths, chandeliers, jewelry, Hermes scarves…the list is endless. Several architectural pieces caught my eye as well as a large framed chalk board featuring “Bee” Happy by the talented Frances Schultz—check out her very entertaining blog here. The new rug area is filled to the ceiling with beautiful rugs in ever size imaginable. Put Peachtree Battle Antiques on your list of shopping stops today—and just give them a call if you see something you like. I spotted these great leather chairs—they need a home. Love seats are always a good idea. This server would make a great bar. I love this large chalk board with a quote from Francis Schultz. This whole table was full of Majolica. They have a huge selection of mirrors right now. I have one just like this in my house. This would make a great coffee table inside the house or on a covered porch. This is a great garden birdcage. Great ideas for your mountain or lake house. Don’t miss the new rug area downstairs. What a great selection to choose from. Have a great visit—you will love it. Be sure to stop by Boxwoods and Erika Reade too! I need to go shopping here!!! Did you come home with some treasures? I did find a couple of treasures—two of the green Ikat table clothes. I’ll take the blue and white transferware platters just wrap them up! Love the marble top faux bamboo piece and the Louis Phillippe mirror. I must say Charles Faudree would have been right at home in this shop. So many classic and timeless finds. Victoria, Give them a call and have them wrapped and ready for pick-up. Wow!!! So many beautiful things !! Thats on my list of to dos this week!!! They are jam-packed right now—have fun!